Last week I was at PuppetConf in San Francisco, speaking about automating the build-test-release-deploy lifecycle for Puppet modules and how we use them. Check out the PuppetLabs blog The Puppet Forge: Modules From Design to Deployment and see below the original post at MaestroDev’s blog and some (quite unrelated) pictures I took. More conference pictures in the official Flickr account. 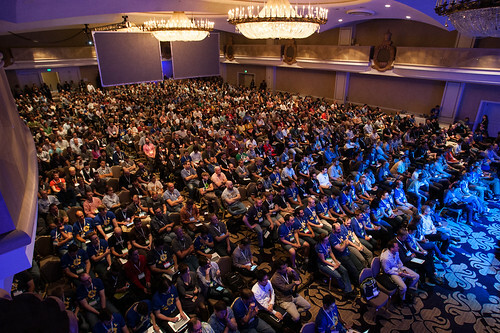 Last week PuppetConf took place at the Fairmont in San Francisco, gathering Puppet users and enthusiasts from all over the world for five days of training, development and sessions. MaestroDev was present at the event as we are heavy Puppet users, and contributors! We are currently the 3rd most frequent contributor to Puppet modules in the Puppet Forge and publish 30 modules, of the 50 that we use on a day to day basis. Our architect Carlos Sanchez gave a presentation on How to Develop Puppet Modules: From Source to the Forge With Zero Clicks, showing how to apply an automatic build-test-release-deploy cycle for Puppet Modules, because, when you use Infrastructure-as-Code you have to apply the development best practices to your infrastructure. In a demo, he showed how we use Maestro to automatically build, test, release and deploy our Puppet modules to the Puppet Forge, triggered on each commit for a truly Continuous Delivery experience. And, not only do we use Puppet to provide module deployment to the Forge, we also integrate Maestro with Puppet and Puppet Enterprise to automate Puppet updates across your Puppet agents. When you put these capabilities together with other development automation capabilities you achieve Continuous Delivery for both your applications and infrastructure. Imagine you are building or releasing the latest version of your software and need to propagate an update through all the Puppet agents running, as well as any updates to config files or packages managed by Puppet. Instead of waiting for the next Puppet run to happen, Maestro can automatically deploy the Puppet manifests and modules to the Puppet master after being tested, and propagate those changes as well as the latest application built to all or a subset of the servers running with Puppet agents. Thanks to all the Puppet Labs guys for a great event, and especially to Ryan Coleman for the work he is doing on the Forge and his help getting these Maestro integrations working. We look forward to seeing everyone at the next event!